LAPD officer checks an assault weapon received during a gun buyback in Los Angeles on Wednesday. In the wake of the Sandy Hook Elementary shootings, cities and police departments across the country organized events to buy back guns, hoping, they say, that fewer firearms on the street translates to fewer shooting deaths. That buyback in the Van Nuys district brought in 2,037 guns, including 75 assault-style weapons, NBCLosAngeles.com reported. But critics say buybacks are a fruitless exercise – more political theater than effective policy. “It’s like trying to drain the Pacific with a bucket,” Alex Tabarrock of the conservative Independent Institute told USA Today in 2008. There are an estimated 310 million guns in the U.S. -- about one for every U.S. resident. Such criticism hasn't stopped police departments, which have hosted gun buybacks for years, encouraging residents to turn in their firearms – no questions asked – for cash or gift cards, usually $50 to $250. Some police departments offer a sliding scale, giving more money for semi-automatic firearms, which were used in the ambush on firefighters in Webster, N.Y., last week, the Newtown shootings two weeks ago, at the Sikh temple attack in Oak Creek, Wis., in August and in the theater shooting in Aurora, Colo., in July. Among those turning in their guns in events this month were parents and grandparents who told reporters they worried about having weapons around. A grandmother in Brooklyn attended a gun buyback the day after the Connecticut school shooting on Dec. 14 and told gothamist.com that fatal shooting of 20 children -- most of them 6 years old -- moved her to hand in her gun. In Camden County, N.J., police heard from residents who wanted to turn in their weapons in light of the Newtown shootings. The buyback there retrieved more than 1,100 weapons, according to the Philadelphia Inquirer. That buyback was so successful that officials handed out all of the $110,000 in forfeited money that the Attorney General's Office had provided. They gave $39,000 in IOUs that they will honor with future forfeited money. Nearly all of the guns were operable, according to the Inquirer. In southern Florida, an Uzi submachine gun “like the one used by Scarface” was turned in to a buyback sponsored last weekend by the Opa-locka Police Department, the Miami Herald reported. Two Uzi-style guns turned up at a buyback Friday in San Diego that was sponsored by African-American ministers. That buyback retrieved 360 weapons before 10 a.m., according to The Atlantic. 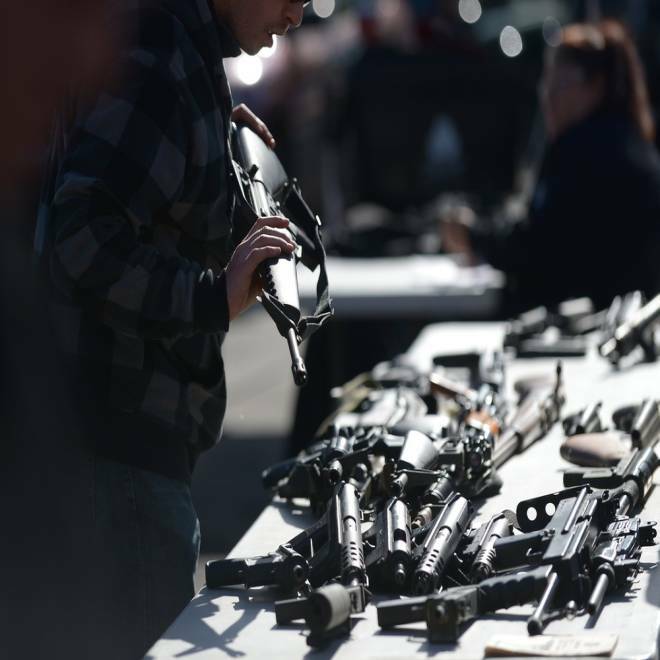 Bill Stowers, 59, told the Los Angeles Times he attended the San Diego gun buyback because he worried that his 12-gauge shotgun might fall into the wrong hands given the break-ins in his neighborhood. "I don't need this shotgun sitting around," Stowers said. He received a $50 gift card. The murder of 20 youngsters and six educators in their classrooms has galvanized the public’s desire for immediate action, and partnering with the States on a nationwide gun buyback program is a modest, common-sense start.